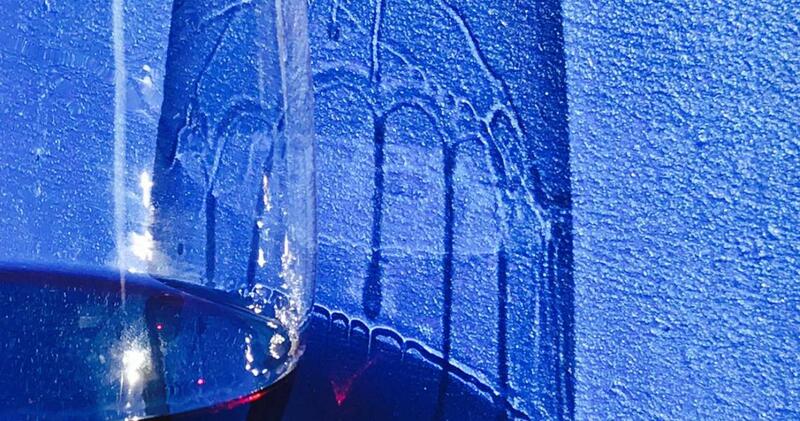 NJIT’s Shahriar Afkhami and colleagues shine new light on dynamics underlying the Marangoni Effect, commonly manifested in the “tears of wine” phenomenon. Shahriar Afkhami, NJIT associate professor of mathematics, and colleagues on an international research team have successfully quantified mysterious dynamics underlying a phenomenon in liquid physics, known as the Marangoni Effect. Their findings, published in Nature Physics on July 31, could potentially lead to more effective drug delivery methods and help eliminate contamination during the cleaning of liquid surfaces. The Marangoni phenomenon — commonly recognized as the “tears of wine” that form and drop along the rim of a wine glass — occurs when two miscible liquids of different surface tension meet. That meeting causes one liquid with greater surface tension (water) to pull on the surrounding liquid with more force than areas with lower surface tension (alcohol). In the case of the “tears of wine” effect, alcohol evaporation naturally lifts wine up the glass — raising the water concentration of the liquid and raising the overall liquid surface tension for the effect to take place. Under the contractile force of flow, the liquid begins to pool into droplets on the glass walls until they outweigh the force of the effect and fall back into the wine. Afkhami and the research team, led by Professor Howard A. Stone at Princeton University, used a new theoretical model and advanced flow visualization techniques to predict and capture the dynamics of the Marangoni effect produced by a single alcohol drop on water in real-time. The lab was able to calculate previously unknown Marangoni-driven factors such as surface liquid mixing time, spreading time and length scale. Afkhami is now leading research at NJIT to enhance the computational model used to understand the Marangoni effect, which was first developed by one of his former Ph.D. students, Ivana Seric, and co-advised by Lou Kondic, professor of mathematical sciences at NJIT. The National Science Foundation partially supported their research. Shahriar Afkhami is an associate professor in the Department of Mathematical Sciences at NJIT researching computational fluid dynamics, high-performance computing, and algorithm development for modeling flows of complex fluids. Afkhami is currently investigating interfacial dynamics in liquid-liquid and liquid-liquid-solid systems.